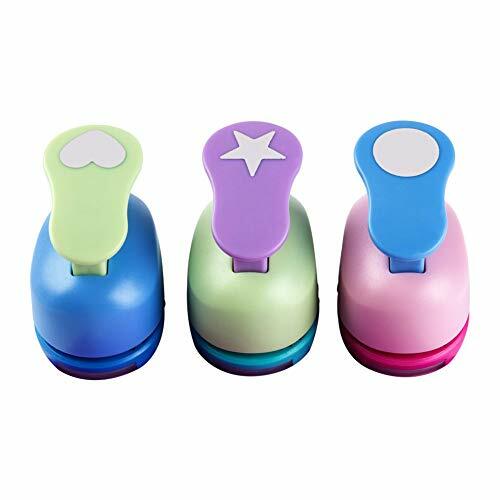 Plastic; Craft punch size: 2.7x1.4x2.4inch; Punch out size: 0.98x0.98inch; Color: Randomly assorted; Styles: Randomly assorted; Package included: 3Pcs x Craft Punches. 2.Perfect for kids' DIY artwork, gift wrapping, envelopes, memory books, greeting cards, gift tags, scrapbooks, cards, decorations and any paper craft. Puncher Size in 2.8"x1.7"x2.2",and the cuts are 1" X 1"
Perfect for punched out images to decorate cards, envelopes, kids artwork, scrapbook pages, photo frames décor, origami, gift wrap, decorations, embellishments and more. Easy to Use, Good for DIY Scrapbook, Greeting Cards Making and Kids' Artwork. Material: Plastic. Please keep away these items from 0-3 years old children for safety. If you have any questions about this product by SICOHOME, contact us by completing and submitting the form below. If you are looking for a specif part number, please include it with your message.